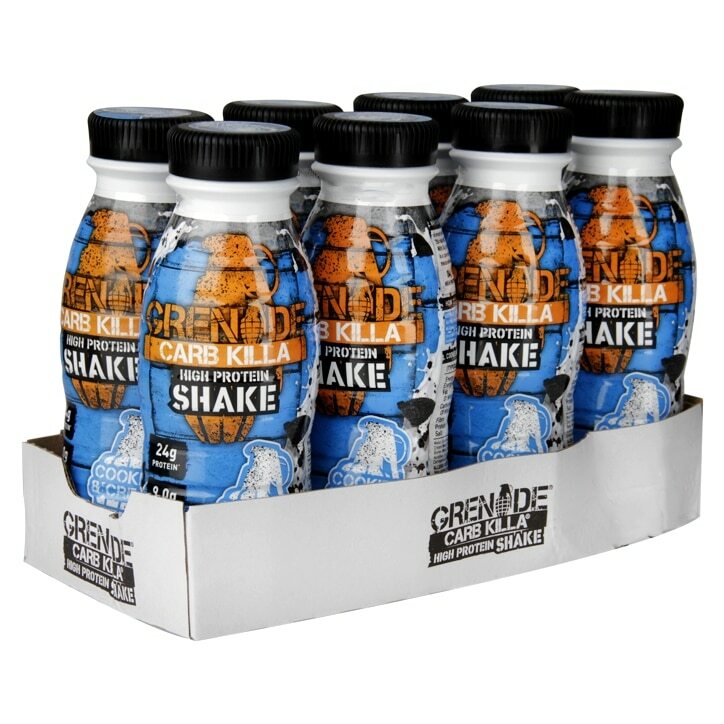 Thick, creamy & seriously indulgent, Grenade Cookies & Cream Carb Killa shake is a high protein drink. Drink between meals for additional protein with a great cookies & cream taste - without unwanted calories or carbs! With 25g of protein and only 7g of carbs, Carb Killa Shake is a convenient way to up your protein intake. Each drink is 330ml. Water, Skimmed Milk (27%), Milk Protein Powder (7%), Cream (Milk) (5%), Maltodextrin, Butter Biscuit (0.5%) (Wheat Flour, Sugar, Butter (Milk), Whey Powder (Milk), Baking Agent: Potassium Carbonate; Salt, Acidifier: Citric Acid), Caramel Sugar Syrup, Stabilisers: Gellan Gum, Carrageenan; Sweeteners: Acesulfame K, Sucralose; Salt, Natural Flavourings. Grenade Carb Killa Shake Cookie & Cream is rated 5.0 out of 5 by 7. Rated 5 out of 5 by Notgiven from Love it! Not too sweet. Does the job! I keep a couple in the car. Rated 5 out of 5 by Dony G from Grenade cookies n cream protein Very good product. I will be buying more when it's on offer again!! Rated 5 out of 5 by Dee999 from Best protein shake I have tasted! Absolutely delicious, not chalky like some protein shakes, love them and will be buying more! Rated 5 out of 5 by AndyWH from Tastes Amazing Just as good as the bars and less than 200 calories!